The Hogan Cup got under way in the Blackpool and District Youth Football League and in the under 13 section it was a landmark day for Nat Gili-Ross. 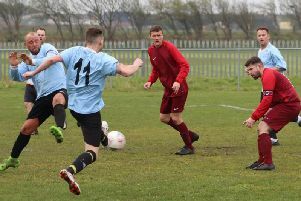 He scored all six goals in YMCA’s 6-3 win over Thornton Cleveleys Whites as YMCA made it through to the second round of the Hogan Cup at a cold and wet Seafield Road. The hosts were on top throughout the first half and Gilli-Ross’ hat-trick put them in control at half-time. To Thornton’s credit, though, they came right back into the game after the restart and for a 15-minute spell YMCA struggled. Thornton began to penetrate YMCA’s rearguard and netted three times through Joel Howarth, Jadyn Walsh and Cameron Rawcliffe. Fortunately for YMCA, Gili-Ross maintained his clinical finishing to hit another three goals and to claim a double hat-trick. Harry Dyer, Noah Simister and Angelo Vinci all impressed throughout for YMCA. Another hat-trick hero was Matthew Finney for BJFF Blades as they beat Lytham Maroons 8-0. There were four goals apiece for Jak Roper and Ben Marshall as Thornton Cleveleys Reds beat Foxhall Hoops 13-1. Their other five goals were shared between Lewis Barnes(2), Fraser Hallas, Louis Johnstone and Armin Khobabash. Liam Ruddy replied for Hoops. Spirit pulled one back with a well-taken finish from Nathan Tolley, Lytham scored two further goals before the interval through Daniel Pilling and Kai Clarkson Lowe. Callum Brown scored twice and a further goal from Thomas Hanslip gave Layton a 3-2 win against Fleetwood Gym. In the league, there was a brace each for Matt van Wyk, Lucas Kilgallon and Joseph Newell as St Annes Greens beat FC Rangers 7-1, Scott Cowgill scored the other and Callum Moore replied. In the under-18 division, Oli Muir’s treble and goals by Ben Bradley(2) and Arron Watefield gave Foxhall a 6-0 win at St Annes to send them nine points clear at the top of the table. Phase two of the league campaign for Poulton and District Primary clubs is under way and Blackpool Rangers Seasiders were 2-1 winners over BJFF Warriors in the under-12 premier league. In this typically hard-fought derby, the Seasiders made the brighter start and Matty Poole finished a smart passing move to open the scoring. The remainder of the first half was very even, with both defences holding strong. The match continued in the same vein until Ben Wilson latched on to a Henry Wilshaw pass and coolly slotted the past the stranded Warriors keeper. However, it was soon game on again as the Warriors scored almost straight from the restart. Both sides continued to threaten and had chances but it remained 2-1. Jake Kirby impressed with some great saves for the Seasiders but their man of the match award was shared between Harrison Tweedale and Thomas Doogan, both showing great character, cool heads and steely resolve throughout. Also in the under-12 peremier league YMCA produced an outstanding team performance to win 5-0 away to Clifton Rangers Wasps. Despite it being a cold damp morning and a wet surface, YMCA soon came to terms with the conditions and they edged into a 2-0 lead at half-time. They continued to have the upper hand in the second half to complete an impressive win. Dean Fenwick hit a pair, with Yash Passi, Noah Mawene and Daniel Slawson all on target also. Ross Hurst and Kaiden Pirrie both shone throughout for YMCA. YMCA’s Under-11s were in action in their Coulton Cup group, facing Poulton Galaxy at a a cold and drizzly Seafield Road. The hosts enjoyed most of the possession in the first half and broke the deadlock with a well-taken goal by Ali Ruman. That’s how it remained throughout the second half as YMCA emerged narrow winners. It remained 1-0 for the home side at the interval and even though they continued to dictate the game after the restart they didn’t manage to add any further goals. In the Under-11 Classic Cup, BJFF Blades Whites were 8-0 winners away to FC Rangers in this revamped competition. It was a beautiful morning at Boundary Park, though the pitch was a leveller. The visitors pegged Rangers back and Taylor Shaw’s short bounced off the crossbar. Fin Hambly’s shot also struck the bar on 18 minutes but this time bounced down over the line. BJ took confidence from the goal and were 4-0 by half-time after Raedan Shirran blasted home, Oliver Ward finished a good move down the left hand and Will White lobbed the keeper, aided by the sun. BJ were quick out of the blocks in the second half, Taylor Shaw making it five with a strong run and cool shot. Taylor grabbed his second in similar style before Luca Morelli reacting quickest to make it seven, his initial rasping shot having been saved. Josh Nester wrapped up the scoring, turning on the ball and picking his spot in the corner. FC Rangers battled well and their keeper was outstanding, but they couldn’t prevent BJFF progressing to the quarter-finals. Morelli was BJ’s man of the match, harassing opponents and winning possession throughout, besides using the ball well. He topped off a great performance with a fantastic goal. Finally, the Challenge Cup tie between Spirit of Youth and BJFF Predators Whites went to penalties. Both keepers pulled off fine saves but it was Spirit who won the shoot-out. The preceding match had been one of two halves, Spirit applying pressure in the first half to move into a 2-0 leads only for Caden Craig to scored twice and level the scores. Kieren Daw was outstanding for BJFF. YMCA girls were in dominant mood in their North Valley and Burnley Unity League clash with Whitworth Valley, defeating the Rochdale side 17-1 at Seafield Road. Despite being inactive for five weeks, YMCA quickly dusted off their cobwebs with some impressive flowing football and took the lead after only 10 minutes. A long ball from Megan Lewis found captain Ellie McNally, who made no mistake with a fine finish. They doubled their lead when Isabelle Kells capitalised on a weak clearance from the visiting keeper and McNally scored her second to make it 3-0 with a controlled finish. A throw-in from McNally then caused havoc in the defence and Annabelle Jackson made it 4-0. McNally netted three more to take her first-half tally to five. Kells was also on target again to give YMCA an 8-0 lead the break. YMCA looked in no mood to ease off but it was the visitors who scored next. However, YMCA quickly resumed their earlier dominance to blitz the visitors, with McNally scoring a further four goals to complete a tremendous treble hat-trick. Kells added four more to bring her match tally to six, with Jackson netting her second near the end. Georgia Norman was outstanding throughout for YMCA with her mazy runs on the right and she can count herself unlucky not to get on the scoresheet too. Honey Griffith, Lara Pilling and Phoebe Davies were all notable also in a resounding victory.